We had a wonderful day in the Barrow Media Center learning from author and illustrator, Meghan McCarthy. She is the award-winning author/illustrator of books such as Pop the Invention of Bubble Gum, The Aliens Are Coming, and The Incredible Life of Balto. She shared with every grade level during 3 sessions. Her talk included a close look at her early writing as a child. The students loved seeing that she made lots of spelling errors as a child and drew drawings that looked very much like things that they draw in school. She showed them how her writing and illustrating evolved through High School and College. We learned about her family stories and interests, which inspired many of her books. She showed students how a book is published and walked them through what each step looked like in pictures and videos. I loved seeing how her research impacted both her writing and her illustrations, like making sure the bathing suits were from the right time period in one of her books. 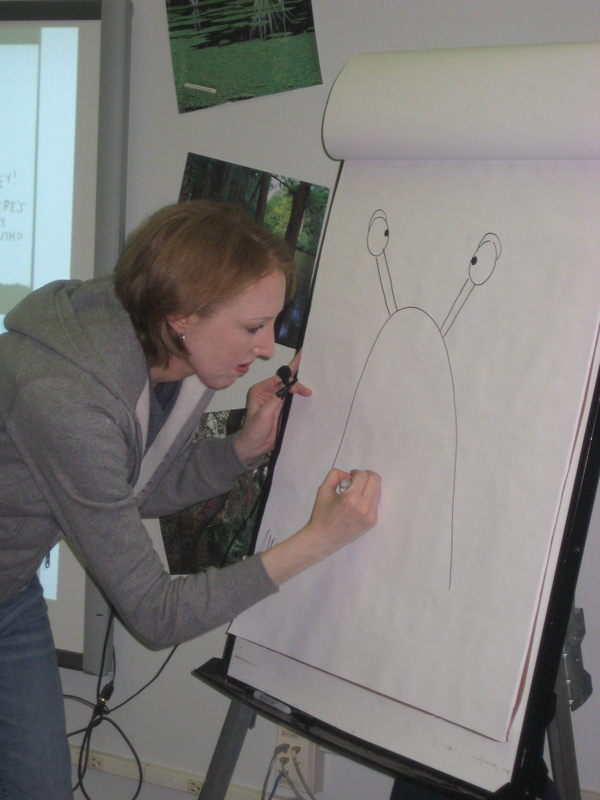 Finally, she showed students how to draw the dogs, horses, aliens, and birds in her books. She included her signature “big eyes” in each illustration. After today, Meghan will speak at the Georgia Conference on Children’s Literature in Athens, where I will also be presenting on Techno Poetry. This entry was posted in authors and tagged author visit, meghan mccarthy.